SEATTLE, Wash.— The death of the two-year-old male orca known as “J52” was confirmed Sunday by the Center for Whale Research, which reported malnutrition as the likely cause. The population of critically endangered Southern Resident killer whales, which makes its home in Puget Sound and migrates along the West Coast, has dipped from 83 last year to only 76 individuals today. This death represents the biggest decline from year-to-year ever recorded. The National Marine Fisheries Service singled out Southern Resident killer whales as one of eight species most at risk of extinction in its 2015 “Species in the Spotlight: Survive to Thrive” report to Congress. Yet agency officials have resisted calls from conservation groups and a petition signed by more than 100,000 people to quickly expand critical habitat protections for this orca population from the 2,500 miles now designated around Puget Sound to cover more of its full 9,000-mile habitat range along the West Coast. The Center petitioned for areas off the coasts of Washington, Oregon and California to be protected, which the National Marine Fisheries Service said is warranted and agreed to propose a rule for in 2017. “These killer whales depend on management decisions which span from oceans to rivers, where salmon will grow up to become orca food,” said Whitney Neugebauer, Whale Scout’s director. “We must all choose to be stewards of the places where we live and make tough choices if we are to save these whales." The Southern Resident population is threatened primarily by lack of food due to declining chinook salmon runs as well as toxic pollution, noise and disturbance. 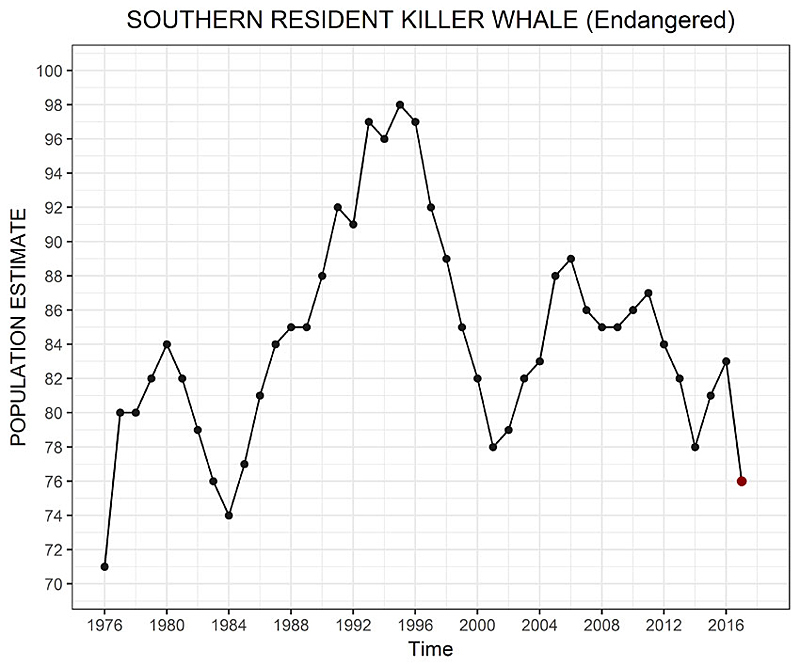 In a recently published paper, University of Washington biologist Samuel Wasser and his colleagues report that from 2008 to 2014, nearly 70 percent of Southern Resident killer whale pregnancies failed, either in miscarriage or with the calves dying immediately after birth. The Center for Biological Diversity is a national, nonprofit conservation organization with more than 1.5 million members and online activists dedicated to the protection of endangered species and wild places.